If you’ve never tried Zoodles, a.k.a. 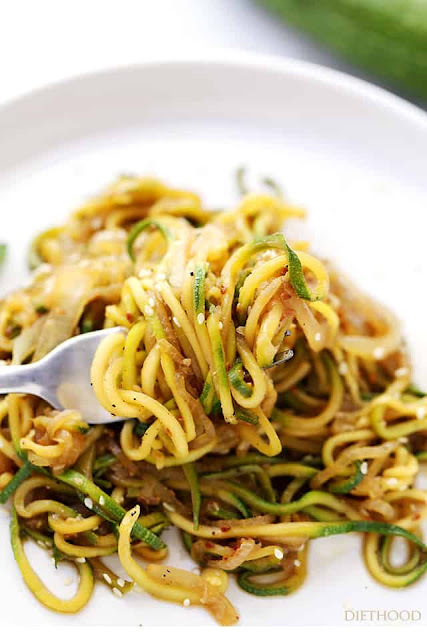 zucchini noodles, OMG! You.are.missing.out! But, hey hey hey, sweet friends! TGIF! Weekend plans include catching up with my DVR (I’m seriously itching for a Real Housewives marathon), then coffeeing with my lovely friends, and I’m also thinking about possibly sleeping in 2 days in a row. I’m dreamin’ big! In other news, I’m spiralizing zucchini and making you believe that you’re eating noodles! Scouts honor, the texture is so spot on that you’ll definitely trick yourself into believing that you’re slurping up pasghetti. You’ll see. Today’s vibrant and delicious recipe is sponsored by my kitchen-gadget-faves, OXO! Their new Hand-Held Spiralizer is my new favorite kitchen toy because I get to make pasta that’s not really pasta, but it tastes like pasta?! (say what?!?) Okay. It’s also great for making zoodles, obvi, curly fries, salads, desserts, etc… Best of all, it’s perfect for all my low-carbin’ friends, diabetics, and for those staying far away from gluten. The spiralizer has us all taken care of. Takes 20 min , serves 4.